The Design Institute for Health invites you to join us at the frontier of design in health for a thought-provoking presentation, healthfully-designed happy hour, and behind-the-scenes tour of our UT Health Austin’s revolutionary clinics of the future. The Design Institute for Health is a first-of-its kind institute born from the radical collaboration between Dell Medical School and the College of Fine Arts at the University of Texas Austin. Through design, the Design Institute provokes every aspect of health to work better for people. We’ll welcome you into this frontier with a thought-provoking production in the Health Discovery Building auditorium that introduces the design and health communities to vivid examples of the challenging problems to solve and some solutions realized. Design has walked through a lot of clinical doors (medical devices), some hospital doors (service design), and a lot of wellness doors (spa-type wellness/beauty products), but it has walked through precious few primary care doors, and even fewer doors around the social determinants of health, truly person-centered health, mental healthcare, value-based healthcare, and more. Building on the theme of “open doors” we will offer several doors that design in health has opened and also, a few that remain closed – ones that we’d like to open together with the audience. Delicious doesn’t have to be unhealthy. Nourish yourself with some healthfully-designed, tasty treats toasting health in the lobby of the Health Discovery Building. Tour groups will leave from here to tour the clinics. Continue on with us for a rare, behind-the-scenes tour of the UT Health Austin Clinics in the neighboring Health Transformation Building. 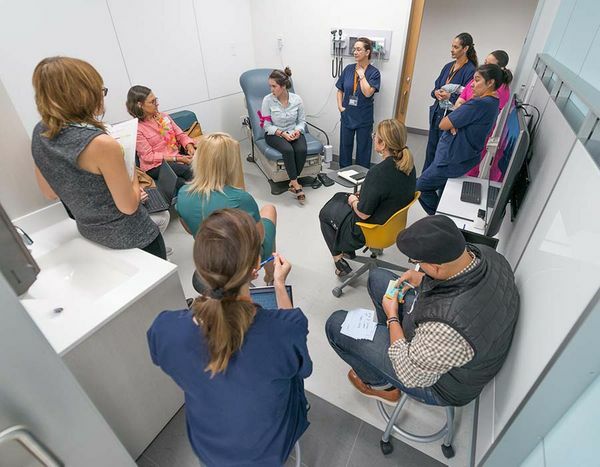 These new, revolutionary design-led clinics feature no waiting rooms, a self-rooming system, front-of-house spaces designed for comfort, exam rooms designed for shared-decision making, and back-of house spaces designed for provider team collaboration. The clinics reorient the experience and provoke entirely new relationships between patients and providers, within care teams, and most importantly, between a patient and their role in their health. A behind-the-scenes tour of these clinics offers a tangible, built environment experience of how design is provoking healthcare to change as we create clinics of the future. Parking available in the Health Center Garage (1601 Trinity Street).